M Sport - Clean CARFAX - No accidents - Fully Serviced - QUALITY CERTIFIED up to 10 YEARS 100,000 MILE WARRANTY M SPORT SEATS Power Passenger Seat Power Driver Seat Bucket Seats PARKING ASSISTANT M SPORT Aluminum Wheels Leather Steering Wheel Power Passenger Seat Power Driver Seat Bucket Seats DRIVER ASSISTANCE PLUS Lane Departure Warning Blind Spot Monitor TRANSMISSION: SPORT AUTOMATIC W/SHIFT PADDLES 8-Speed A/T Transmission w/Dual Shift Mode A/T PREMIUM PACKAGE HD Radio Satellite Radio Power Door Locks Keyless Entry Passenger Adjustable Lumbar Driver Adjustable Lumbar Remote Trunk Release TECHNOLOGY PACKAGE Navigation System Heads-Up Display Hard Disk Drive Media Storage MP3 Player COLD WEATHER PACKAGE Heated Rear Seat(s) Heated Front Seat(s) JET BLACK CORAL RED/BLACK, DAKOTA LEATHER UPHOLSTERY Leather Seats M SPORT BRAKE 4-Wheel Disc Brakes DYNAMIC HANDLING PACKAGE Active Suspension *Note - For third party subscriptions or services, please contact the dealer for more information. * Put performance, safety, beauty, sophistication and all the right amenities into a car, and here it is! Now you can own luxury without the luxury price tag! Start enjoying more time in your new ride and less time at the gas station with this 2014 BMW 3 Series. No matter the weather conditions or terrain, this Jet Black AWD BMW 3 Series handles with an elegant confidence. Fine interior appointments complement this vehicle's unprecedented performance. The 3 Series 335i xDrive M Sport - Clean CARFAX - No accidents - Fully Serviced - QUALITY CERTIFIED up to 10 YEARS 100,000 MILE WARRANTY is well maintained and has just 44,487mi. This low amount of miles makes this vehicle incomparable to the competition. Added comfort with contemporary style is the leather interior to heighten the quality and craftsmanship for the BMW 3 Series This BMW 3 Series is equipped with navigation, so you no longer have to wonder if you're headed in the right direction. 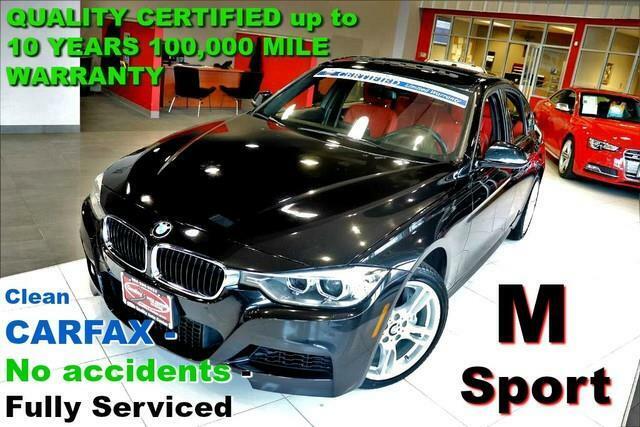 Know exactly what you're getting when you take home this BMW 3 Series as past service records are included. This BMW 3 Series is beautiful and the interior is clean with virtually no flaws. If you're looking for world-class speed, acceleration, cornering and handling, don't blink because you'll miss this truly amazing automobile. This wonderfully appointed vehicle comes equipped with the options and features every driver craves. High-performance tires are another option found on this vehicle. The paint on this car has no serious defects, blemishes, scratches or scrapes. This rare vehicle is a prime example of automotive engineering perfected. Amazing wheels help set this BMW 3 Series apart from other vehicles like it. More information about the 2014 BMW 3 Series: The BMW 3-Series is a family of sporty sedans and wagons sized at what would be considered a compact car in the U.S. 2014 BMW 3-Series Sedans and Sports Wagon models are built on a new-generation platform that made its debut with the 2012-model sedan--and is slightly longer, lower, and wider. Across its entire lineup, the 3-Series models stand out for being athletic, responsive and fun to drive--as well as more fuel-efficient than most other alternatives. The F30 redesign brought more back-seat space and cargo space to sedans, as well as a more sophisticated, isolated ride. M3 models, meanwhile, continue to be one of the most practical high-performance cars on the market. Interesting features of this model are high-tech options, compact size and maneuverability, fuel efficiency, practicality and comfort, A wide variety of options, athletic driving feel, and long list of appearance packages and trims No Credit / Bad Credit / No Paystubs, No problem !! ! All Approved ! Everyone drives ! CLEAN, GORGEOUS, LOW MILES, SHOWROOM CONDITION. CALL NOW QUALITY CERTIFIED up to 10 YEARS 100,000 MILE WARRANTY , To Certify a vehicle, there will be an additional cost for Certification. CALL NOW For details. STUNNING AGGRESSIVE LOOK ON THIS BEAUTIFUL--Call today to schedule a test drive... Good Credit/Bad Credit/No problem!!!! Get paid cash? No problem!! 100% Credit Approval with interest rates starting at 2.49% for qualified customers, our rates will not be beaten. We price our cars at wholesale price to guarantee the best deals for our customers. Our inventory moves quick, please call to confirm the availability of the vehicle of your interest Springfield location 973-564-0112. This vehicle is located at our SPRINGFIELD location. Come visit our new showroom in Springfield NJ. This 2014 BMW 3 Series 335i xDrive is offered to you for sale by Quality Auto Center. Quality and prestige abound with this BMW 3 Series. If you are looking for a vehicle with great styling, options and incredible fuel economy, look no further than this quality automobile. Once you see this BMW, you'll quickly see that this is the perfect vehicle for the outdoor junky! You'll even feel relaxed knowing that this All-Wheel drive vehicle will get you to where you are going no matter what may come your way. Also, with this BMW 3 Series's dependable control you'll be able to drive into the sunset without a care in the world! One of the best things about this BMW 3 Series is that it has low, low mileage. It's ready for you to truly break it in. More information about the 2014 BMW 3 Series: The BMW 3-Series is a family of sporty sedans and wagons sized at what would be considered a compact car in the U.S. 2014 BMW 3-Series Sedans and Sports Wagon models are built on a new-generation platform that made its debut with the 2012-model sedan--and is slightly longer, lower, and wider. Across its entire lineup, the 3-Series models stand out for being athletic, responsive and fun to drive--as well as more fuel-efficient than most other alternatives. The F30 redesign brought more back-seat space and cargo space to sedans, as well as a more sophisticated, isolated ride. M3 models, meanwhile, continue to be one of the most practical high-performance cars on the market. Interesting features of this model are high-tech options, compact size and maneuverability, fuel efficiency, practicality and comfort, A wide variety of options, athletic driving feel, and long list of appearance packages and trims No Credit / Bad Credit / No Paystubs, No problem !! ! All Approved ! Everyone drives ! CLEAN, GORGEOUS, LOW MILES, SHOWROOM CONDITION. CALL NOW QUALITY CERTIFIED up to 10 YEARS 100,000 MILE WARRANTY , To Certify a vehicle, there will be an additional cost for Certification. CALL NOW For details. STUNNING AGGRESSIVE LOOK ON THIS BEAUTIFUL--Call today to schedule a test drive... Good Credit/Bad Credit/No problem!!!! Get paid cash? No problem!! 100% Credit Approval with interest rates starting at 2.49% for qualified customers, our rates will not be beaten. We price our cars at wholesale price to guarantee the best deals for our customers. Our inventory moves quick, please call to confirm the availability of the vehicle of your interest Springfield location 973-564-0112. This vehicle is located at our SPRINGFIELD location. Come visit our new showroom in Springfield NJ.